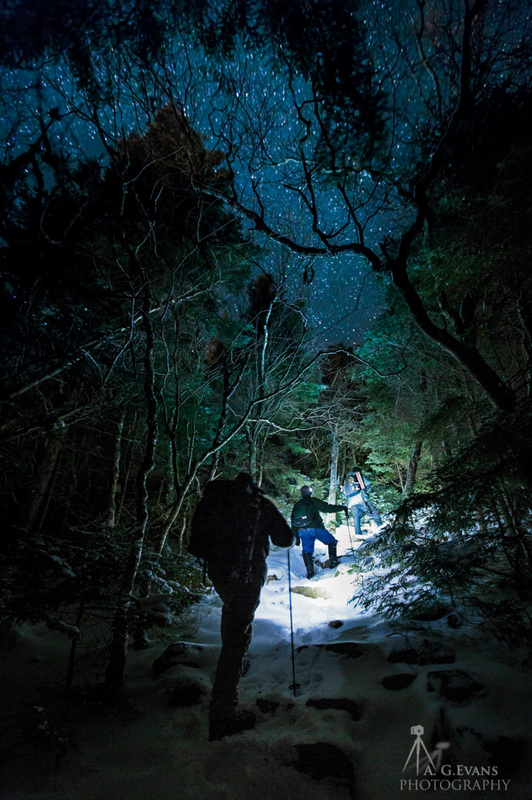 On the night of December 27, 2013, Chris Georgia, Garrett Evans, and I hiked up Artist’s Bluff in Franconia Notch State Park, New Hampshire. What a view! Straight ahead is Echo Lake, to the right are the ski slopes of Cannon Mountain (they were grooming the trails that night), and to the left is Interstate 93 snaking its way through Franconia Notch. Overhead Orion, the Milky Way, Jupiter, and the Beehive Cluster can be seen peeking through the fast moving clouds. 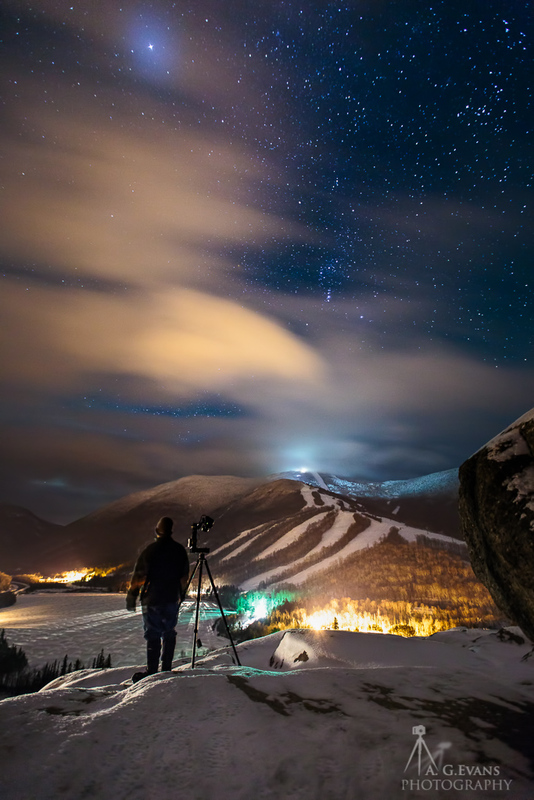 Chris and Garrett are sitting near the edge shooting the lake and mountain, and to the rear is one of Garrett’s cameras shooting a time-lapse of behind the scenes footage. This panorama is a crop of a 360° x 180° sphere that I took with a robotic panning head, in several brackets for a high dynamic range or HDR image to capture the highlights of the bright lights and snow to the shadows of the trees and mountain sides. Later I took a selfie of me holding up the boulder to blend into the sphere later so all three of us could be in the finished shot. The full spherical panorama can be explored on my website. The sphere is stitched from 13 positions (2 rows of 6 columns plus a dedicated zenith shot) of 5 exposures, plus an extra bracket of me standing by the rock, for a total of 70 images. RAW conversion, noise reduction, and sharpening to 16-bit TIFFs was done with Adobe® Lightroom, exposure fusion with Photomatix Pro, stitched with PTGui Pro via an .xml positioning file from the Panoneed, and blended with a combination of PTGui, Enblend, and Photoshop layers by hand—particularly the moving clouds. The interactive sphere on my website is displayed with PanoTour Pro 2.0 and KRPano. 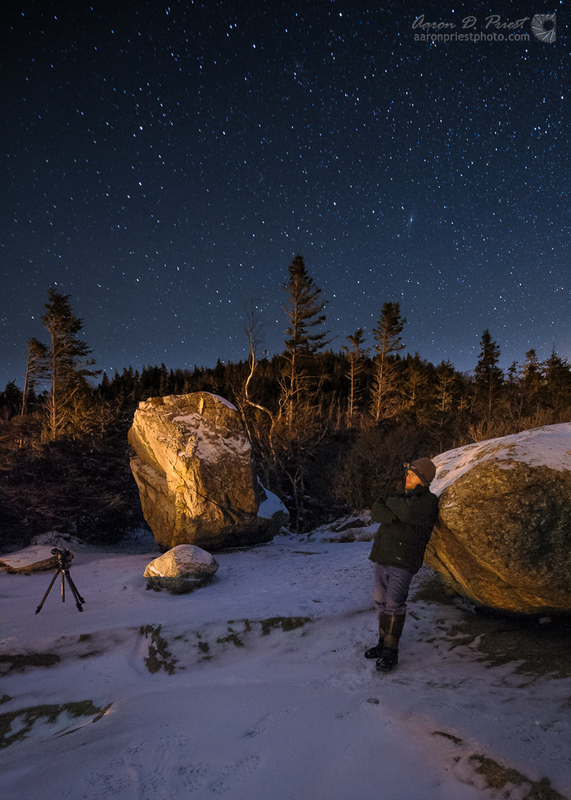 The cropped 3:1 panorama is about 12” x 36” printed out at 300dpi. “Artist’s Bluff” Copyright ©2014 Aaron Priest. Supplemental images ©2014 Garrett Evans. All rights reserved. Beautifully done, thanks for leaving the exif intact. These are the shots I can really appreciate. I love the fact that you worked to get there and pulled off a great few shots. Kind of like hiking to board/ski powder in the backcountry… hard work but there’s something about working for it that really makes the ride down more satisfying. Good stuff. You’re right Ben, sure is! Thanks! Fantastic shots and very nice story! Aaron, thanks so much for sharing these with us. Of course I especially love “Aaron” which so nicely showcases the artist in action in a beautiful scene.